In Halton Arena on a brisk October night during Charlotte’s annual basketball madness, the newest Charlotte 49er, 18-year-old Spanish international Laia Raventós glides into the spotlight as an unfamiliar Niner Nation welcomes her with enthusiastic cheers and emphatic clapping. She is 5’7”, her straightened brown hair gleams in the vibrant white light. She smiles proudly. They’ll know her story soon enough. Hailing from Santa Eulàlia de Riuprimer, her hometown is nestled 45 miles inland from the second largest city in Spain, Barcelona. The Catalan guard has been playing basketball for eight years, picking out open teammates, dishing them pinpoint passes since she was 10 years old. Raventós models her game after Los Angeles Clippers’ superstar point guard Chris Paul. Like Paul, she became a hot commodity in her country fairly quickly. In 2013 she represented her country in the International Basketball Federation (FIBA) U16 Women’s European Championship in which she showcased her skills to the world averaging seven points and just over two assists per game while only playing 20 minutes, half of a game, on average. She was key in Spain’s run to European glory scoring 13 points in the final while pickpocketing Croatia three times in 21 minutes. In 2015 Raventós represented Spain once again on the world stage in the FIBA U18 Women’s European Championship, donning the famous yellow and red jersey with the No. 4 stitched on the front and back. Over the two years, the talented guard blossomed into a leader averaging 11 points in 30 minutes of play per game. She ranked in the top five in field goal percentage from inside the arc and was nearly automatic from the free-throw line, only missing one freebie. Spain captured the gold once again. A week after Charlotte’s basketball madness, in the Charles Hayward Memorial Practice Gym, Raventós is tightly huddled with her teammates in a circle surrounding the iconic 49ers logo at center court. Charlotte women’s basketball head coach Cara Consuegra leads the team in their pre-practice ritual. Raventós opens her winner’s manual as Consuegra reads a passage aloud in English, a foreign language to Raventós. The notebook features team plays along with motivational passages that prepare the ladies before they step onto the hardwood. 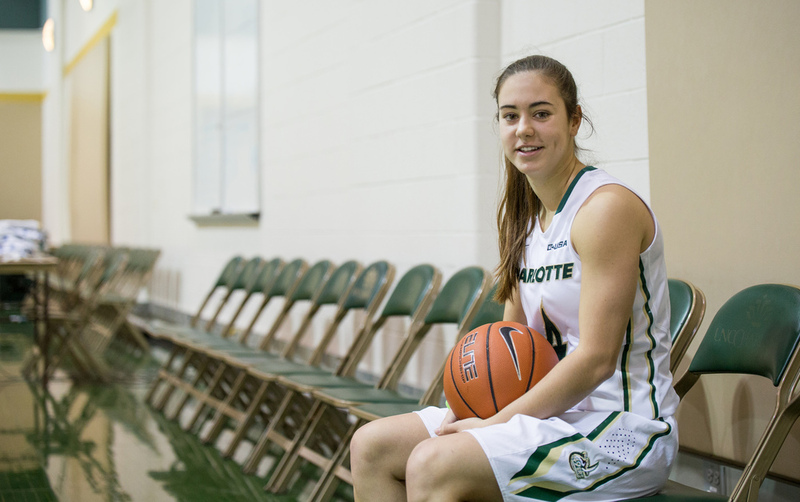 Like Raventós, all of her teammates hail from outside Charlotte but she is the only player representing a foreign nation. Raventós is the first international signee under Consuegra. Her high basketball IQ has been showcased on several occasions as her play has been publicly noted by Consuegra. In practice, Raventós closes out her defender along the 3-point arc while cutting off potential passing lanes to a shooter stationed in the corner. This minor detail sets her apart from teammates. Raventós will have a major role this upcoming season being one of the six talented ball-handling guards in coach Consuegra’s three guard system. Raventós will undoubtedly benefit from playing at the highest level in Europe at such a young age. She has many tendencies that differ from players in the United States as the game has minor dissimilarities. Raventós likes the quick style of play. The future is bright for Raventós, the court is at her feet. For the next week, Raventós and her teammates will work diligently, preparing for opening night at Halton Arena. Raventós’ life has been filled with many firsts, but a competitive basketball game in the United States has not been one. Where are you from in the great country of Spain? I am from Barcelona. It is an area quite different with regard to the rest of Spain and is one of the most beautiful cities. I started at the age of 10. What persuaded you to come to Charlotte? I’ve always wanted to have an experience outside of my country and I believe that by coming here to Charlotte is the best opportunity. I liked the campus a lot when I visited my first time and the coach I am interested in. I liked it very much when we met. What was your family’s reaction to you picking Charlotte? They have always wanted the best for my and saw that I had great enthusiasm for living here. Especially my mother, she helped in terms of roles and the process that I had to do to come here. Leading up to the first game, how different was training camp and coach Consuegra’s teaching compared to the game in Spain? I think that the style of play is very different from Spain. For example we do many more exercises compared to Spain and faster in the United States. I like that style. Looking ahead to your four years with the program, what is one thing you want to accomplish? One thing that I desire to accomplish in four years in Charlotte, is to grow both as a player, as a person and learn as much as I can. What was it like playing basketball internationally at the highest level? Sometimes too much pressure and nerves because when we went to the final, the stage is full of a lot of noise and I believe it is a great experience and you can learn a lot. Granted you haven’t been here long but what’s your favorite thing about Charlotte and the United States? I think that the people. I think the character is very different from the rest of Europe and more open, and you can immediately connect with them. Over the next few months, what are you going to miss the most about Spain? The food because it is quite different and I am not used to it yet. Who’s the funniest player on the team? The most funniest in the team, I believe that it is Lefty, she is always smiling. I don’t even know what to study yet. Who is your role model or influence? Chris Paul, always. I really like the Los Angeles Clippers. They are my favorite team.